Home World WTH Deadly Home Invasion! Lock Your Doors When You Sleep, My Friends! Deadly Home Invasion! Lock Your Doors When You Sleep, My Friends! Spending the best part of my life 'down under', I've obviously been exposed at times to some of the world's deadliest creatures - highly venomous snakes and spiders at the fore-front. But when it comes to 'home invasions', the worst I've come across, is a red-belly black (snake) on one occasion and redback spiders on a few. Never have I experienced anything like this though!! 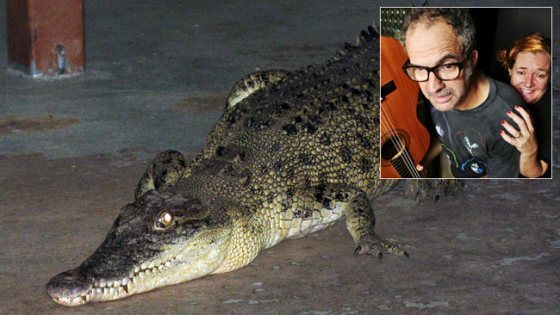 With a guitar as his only weapon, 42-year old Micko Srbinovska managed to make his way past the 1.7 metre salt water crocodile that had managed to find its way into the family loungeroom of his Darwin home, to get to the telephone to call the local 'Crocodile Management Unit'. It's suspected that the monster reptile was an escapee from the Darwin Crocodile Farm. Around 5:30am on Saturday morning, Mick was woken up by his wife Jo, who had been woken herself by their pet dog barking crazily just outside their bedroom door. According to Mick, he "opened the sliding door and saw the crocodile right outside the door... It is pretty full-on when there is a crocodile in your lounge room - I nearly died." By all accounts, residents in the area say that as many as 15 crocodiles have been suspected of escaping from the Darwin Crocodile Farm and turned up on properties over the past five years. I can't believe it!!! I'm afraid of cockroaches so I'm sure I would have had a heart attack if that crocodile was in my house!